LiveHelp: Select this option to receive live help in a wide range of topics. Select the general Topic area and the more specific Subject area in in which you would like to receive assistance. After selecting your Topic and Subject, you may click on the Tutoring Calendar link that is in this area to see when tutors are available to provide assistance in that area. Send a Question: If you have a question and do not want live help, you can submit a question for tutor response. Writing Lab: Upload a paper for review by a tutor. Paper review typically has a 24-hour turnaround time. Language Lab: Select this option for live tutoring support in Foreign Languages or to use the Vocabulary Builder for independent practice. SkillSurfer: Live skills building and a library of lessons, videos, tests, and more. LEAP Learning Platform: Diagnostic test center with customized study plans, lessons, and live tutoring. FlashBulb: Create and share flashcards, tests, and games. MEET: Schedule sessions with friends in our private virtual study room. Brainwave: Create and share movie-like notes and ideas. You may access the Brainfuse service in both the myFSCJ portal and Blackboard. Please see the access instructions below. You may also be able to access Brainfuse on the Tools menu in your individual Blackboard courses if the instructor has enabled the tool. 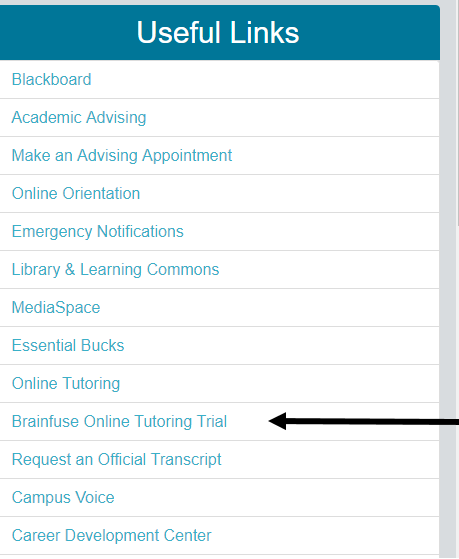 This video provides an overview of the tutoring options and academic and collaborative tools that are available in Brainfuse. This video demonstrates how to use the whiteboard in Brainfuse. This video demonstrates how to use the equation builder in Brainfuse. After you select your desired Topic and Subject area, click on the Tutoring schedule link to see when tutors for this area are available.